One of the finest women athletes ever to come out of Peoria, Jonelle Polk was one of the Big Ten's most skilled players while leading the University Illinois in scoring and rebounding between 1984 and 1987. After winning four letters each in track and basketball at Peoria Manual, the 6-foot-3 Polk went on to score 1,984 points and grab 833 rebounds at Illinois, both still school records a decade later. She was Illinois' all-time leader in scoring for both men and women until Deon Thomas went over 2,000 points in the 1993-94 season. Polk was twice selected to the Big Ten's all-conference team and was fifth in career scoring in the Big Ten going into the 1995-96 season. She was named Big Ten player of the week five times over her last two seasons. Also a fine student, she won the Big Ten's Medal of Honor, signifying excellence in both athletics and academics, in 1987. With the Illini she averaged 20.8 points in 1985-86 and 21.6 the next season. In her Big Ten career she had single game scoring highs of 37, 34, 33 and 32 (four times) and a rebounding one game high of 20. 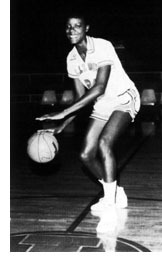 She was a member of the United States pre-Olympic National Selection team in 1987 and was selected to the Illinois all-decade team for the 1980s. After graduating from Illinois she played professional basketball in Italy and France and then was an assistant in charge of conditioning at Northern Illinois University. She now is an assistant coach at Florida State.